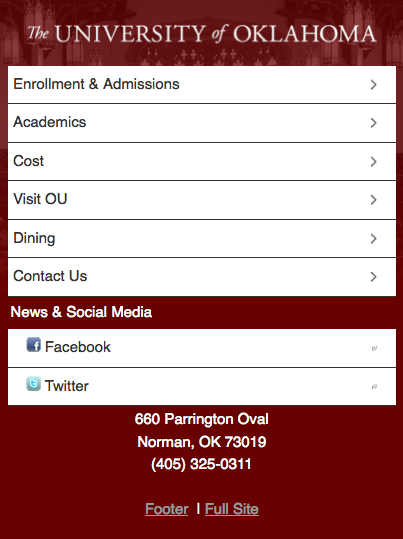 Today we’re launching the first mobile version of the OU homepage! What can you expect? What will be released in future versions? What is a mobile site? Over 200,000 visitors to ou.edu over the last year have viewed it on a mobile device (smartphones, iPads, etc.). That means that even though the OU homepage is viewable on those mobile devices, it’s difficult to read and navigate since the size is not formatted specifically for a mobile device. This new mobile homepage will give iPhone and Android users an option to view content formatted specifically for the size of a mobile phone. What is the single most important purpose of the site? Prospective Students, Prospective Parents. Solution is scalable so that we can add in additional audiences in later phases. – Balance between easy and scalable design/development. In order to get something up quickly, we focused on only one audience for now and used content that’s already available or easy to gather into a mobile format. Future phases could include additional functionality, audiences and services. We should compete with mobile sites of other universities. Content, UI and layout should not stray too far from other schools’ mobile sites as prospective students may visit multiple university sites. When will other departments have mobile sites? For departments in the Content Management System (CQ5), mobile sites are currently in production and we’ll be releasing a project timeline soon. Stay tuned! OU IT has developed some wonderful iPhone apps for OU that are already available to download in iTunes (free!). Find out more about OU2GO and OU4U. Take a look at the new mobile homepage and then complete our survey to help us as we develop new phases. Background graphic and content seem out of place. Why is it “News & Social Media” if it only has links to social media? Did you use a mobile development kit like PhoneGap or jQuery Mobile? Missing that rich interaction, but good try!